I’m a strong believer in the Let Toys Be Toys movement; toys shouldn’t be classed as “boys toys” or “girls toys”. As the mum to a boy, I want to make sure that he knows he is able to play with whatever sort of toys he wants to. So, with that in mind, I was keen to review the Baby Annabell Little Brother doll to see what he thinks. As we are expecting baby number 2, I thought that maybe getting Baby B used to seeing Mummy holding another “baby” might be a good thing! This Baby Annabell Little Brother doll comes with a dummy, bottle (which you can fill with water), bib and tiny nappy! It’s great that it comes with a selection of accessories. He is dressed in a blue baby grow, which is super soft and just makes you want to cuddle him more! 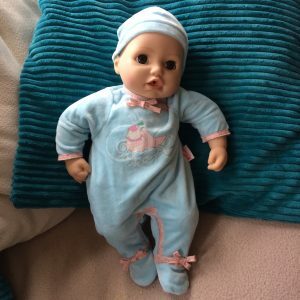 There is a bit of whirring when the dolls eyes open and close, along with the sucking mechanism – but that’s to be expected. It’s great that you can get a reaction from the doll by stroking it’s cheek too! Baby Annabell’s Baby Brother also cries real tears and wets his nappy too. Baby B was wary at first of the baby – especially the way that it gurgles and giggles. Seeing Mummy holding a “baby” made him curious and he soon got used to it and came over for a look. After a few days, he was picking up the baby and bringing it to me. Picking the baby up by the scruff of the neck probably isn’t the best way of carrying an infant, but at least he’s not wary of it anymore! I hope that, in time, having a doll will encourage his nurturing side. At the very least, he has the option of playing with a doll now, so that’s a choice that he can make. I think this doll is great – it’s soft and lovely. It makes a great gift for a boy or a girl. You can purchase this doll for around £49.99 rrp. It takes 3x AA batteries, which aren’t included. So make sure you have some! How can a blanket help Syrian children? Common Matched Betting Problems - Solved!